The crown jewel of the Museum’s collection, this 9,335 square foot architectural model includes 895,000 buildings in all five boroughs. Through guided museum experiences, gallery activities and studio workshops students engage in the panorama as a jumping off point to explore New York’s geography, landmarks, bridges, parks, communities, history, and city planning. As is the case with all our tours, additional connections will be made to highlight the local and International contemporary art works that are also on view. Check our exhibition schedule to see what temporary works will coincide with your group tour! 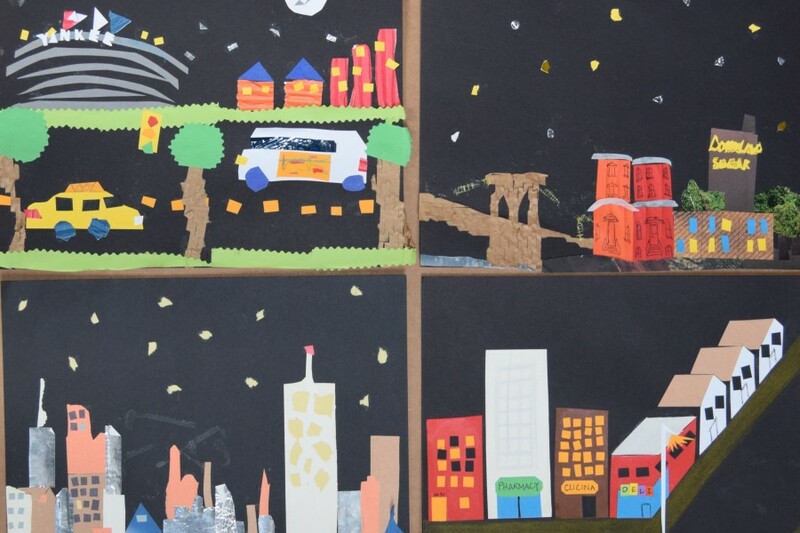 This tactile building project gives students the opportunity to examine the interconnectedness of the city through learning the key components of each borough. They will collaboratively design and construct temporary three-dimensional communities using wooden blocks on fabric outlines of the five boroughs. Please note that students do not take this project back to school. Intentional Connections: Science and Literacy. In contrast to the three-dimensional model of the daytime New York City skyline, students create collages of nighttime cityscapes with emphasis on space and material experimentation. Through questioning and imaginative response, students express their impressions of what their community feels like at night. 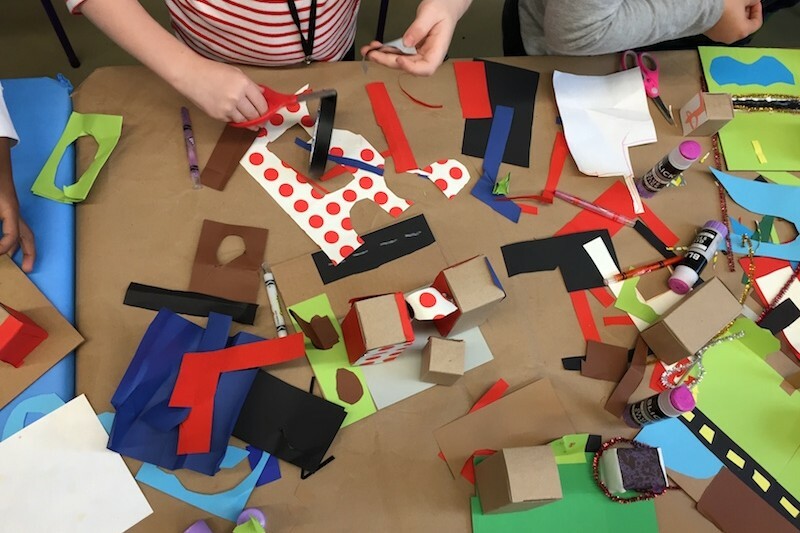 As a precursor or follow-up to the Panorama guided experience, students problem solve while making models of urban communities by creating three-dimensional cardboard city blocks. The focus can be placed on “Sustainability and the Environment”, ‘The Future”, “Transportation” and “Urban Planning”, while examining the differences between urban, suburban, and rural areas. Students draw on the aesthetic cues from the Panorama as well as their own experiences as urban inhabitants. 1. Sustainability and the Environment: Students use the Panorama and Watershed models as a jumping off point to discuss sustainable living, the ecological future of NYC, parks and recreational landscapes, recycling and usage of water and natural resources. 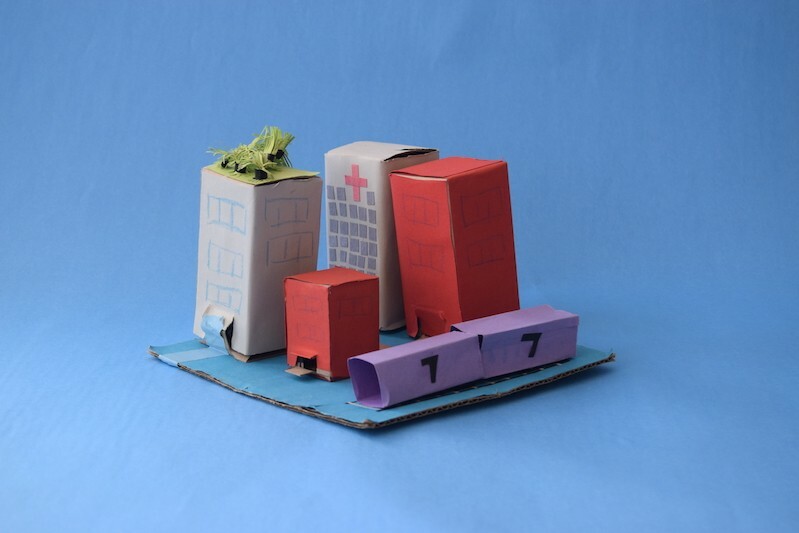 Students will construct models of a city block using sustainably sourced recycled materials. Intentional Connections: Science and Literacy. 2. The Future: Students will focus on the idea of the “World of the Future”, inspired by the 1939 and 1964 World’s Fair. They will investigate how people formed their own future predictions in 1939-1940 and how close those visions were to today’s reality. Students have the opportunity to envision their own symbols for the future. Using a variety of materials, they create three-dimensional symbolic sculptural monuments representing their vision of the future of their communities. Intentional Connections: Social Studies and Literacy. 3. Transportation: Students use the Panorama, Watershed models and Contemporary Art as a jumping off point to discuss modes of transportation used in NYC, with special attention placed on architectural infrastructure like bridges, airports, trains, roads and boats. Using City Block materials, students will construct models of a city block that includes a mode of transportation. Intentional Connections: Social Studies and Literacy. 4. Urban Planning: Students use the Panorama and Watershed models to examine the many parts of living in an urban center, like architectural diversity, the role the environment plays in cities, and the different kinds of spaces people occupy (recreational, residential and commercial). 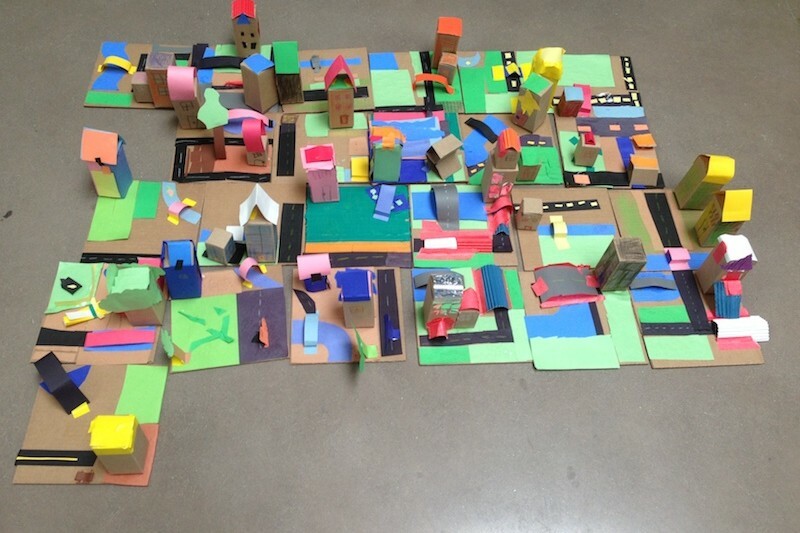 Students problem solve while making models of urban communities by creating three-dimensional cardboard city blocks. Intentional Connections: Social Studies and Literacy. The challenge of making a three-dimensional city block is expanded in our 4th-6th grade version of the city blocks workshop. Students use the Panorama and Watershed historic models as a jumping off point to discuss architecture, sustainable living, and the ecological future of NYC. As a precursor or follow up to their museum guided experience, students will construct models of a city block using sustainably sourced recycled materials. Working in teams, students construct a three-dimensional suspension bridge as they learn about the structural components used in the building of bridges as well as, key architectural terminology. Museum educators will guide students through the panorama with attention to stories of bridge construction and the overarching transportation history of New York City. In 1939, the Works Progress Administration created a magnificent scale model of a relief map of the New York City Watershed, measuring almost 700 square feet and weighing 10,000 pounds, now on display at the Queens Museum. Tours and art activities look at this unique model as students learn about the journey of the City’s water supply system, sustainability, and the water cycle. Students also consider the social relevance of the watershed today by exploring its history and construction. To strengthen their understanding of the connection between the upstate and downstate locations, students also visit the large scale model of the five boroughs of NYC, the Panorama of the City of New York. Students trace the steps of the water cycle and the path of the water from upstate to downstate to its destination in New York City through writing and movement within the Watershed gallery. Additionally, Students visit the Panorama of the City of New York to view and discuss the impact and importance of the water supply on the citizens of the city. Students look for aesthetic clues in the Panorama and Watershed models to understand the factors that impact water consumption, transportation and purification in NYC. Through experiential learning, students will create a mountainous landscape and watch how water collects in reservoirs. Then students will make a drawing that illustrates the next steps in the journey of the water to NYC and use leftover water from the reservoir experiment to paint their illustrations, opening the conversation to methods to reuse our resources. Since 1995, the Neustadt Collection of Tiffany Glass has partnered with the Queens Museum. In a permanent gallery featuring changing exhibitions, students explore how Louis Comfort Tiffany captured nature and transformed it into beautiful lamps and windows of exquisite color and fine detail. Guided museum experiences and studio workshops explore Tiffany in a historical and cultural perspective. Students discover Louis Comfort Tiffany’s glass through a variety of hands-on experiences designed to address the developmental and learning needs of young children. Students participate in storytelling, movement exercises and hands-on art making activities that focus on pre-literacy skills such as shape, color, and pattern recognition, as well as creativity and self-expression. In conjunction with a guided discussion in the Tiffany gallery, students construct faux stained glass window panes using construction paper, transparency paper, and collage materials in the studio, producing a colorful project they take home. During a guided museum experience, students will focus on the idea of the “World of the Future”, thinking about how people formed their own future predictions in 1939-1940 and how close those visions were to today’s reality. Students have the opportunity to envision their own symbols for the future. Using a variety of materials, they create three-dimensional symbolic sculptural monuments representing their vision of the future. Our rotating exhibitions reflect many of the cultures found throughout our diverse borough. Viewing and discussing art from around the world creates the opportunity for students to develop a global perspective as they examine art and create work inspired by their personal vision of the world. How do artists communicate meaning through symbolic imagery? Students will view and discuss specific works in one of the Queens Museums local and international rotating contemporary exhibitions on view. Museum educators will challenge students to define the term “symbol” and source examples of symbols from anchor exhibitions. Next, students will design their own symbolic images and through printmaking explore the reproduction of symbolic images and how color and form impacts meaning in art. Through Studio Art Printmaking techniques, students will create their own repeated symbolic images and understand how artist uses images. A gallery immersion museum experience combines a tour of 1 to 2 galleries with a creative making activity that can be in response to urban planning, the waterways in NYC, mapping, contemporary art and more. These activities are not studio art-making workshops, but rather creative responses to the exhibitions. They often take place inside the galleries, but also in other open spaces throughout the museum. In gallery immersion, QM teaching artists utilize art-making materials to deepen student engagement with an exhibition. Gallery immersion activities are experimental and tactile creative approaches to enhance student learning that can take the form of completed miniature art works, or temporary art installations or the activities can be collaborative and experiential. These approaches are designed so that teachers can repeat them in their classrooms as teaching tools to bridge to their lesson plans. Examples: Creating a map of your routes around the city, creating a water diary of how you utilize water every day, creating postcards, a 3-D collaborative building challenge, creating a museum zine, and creating a transportation zip line.